The BioPharmaPark Dessau is home to pharmaceutical companies which don’t just benefit from the specialist infrastructure and service network that are on hand at the location. The close proximity between the businesses also results in synergies – which range from the production of pharmaceuticals, to their packaging, through to research and development. Human and veterinary vaccines have been developed and made at the location of Dessau in Saxony-Anhalt since 1921. Today, Dessau is home to the BioPharmaPark, which occupies a 120-hectare site. 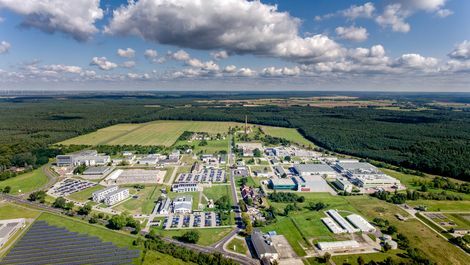 The state-of-the-art location – situated 90 kilometres south of Berlin and 60 kilometres north of Leipzig – has developed into a global centre for pharmaceutical and biotechnology. The businesses that are based here have considerable expertise in the production and packaging of pharmaceuticals, in innovative vaccine technology, in quality control and compliance, as well as in research and development. In addition to the synergies that they make use of here, the companies also benefit from a highly efficient production infrastructure – in particular, that includes the company IDT Biologika, which emerged from the long standing business for the manufacturing of vaccines. The company Technik-Energie-Wasser Servicegesellschaft mbH (TEW) was created in order to support the development of the BioPharmaPark Dessau. TEW creates no-worries packages for both established companies and start-ups. "Anyone who wants to become established at the BioPharmaPark Dessau or expand structurally can focus directly and consistently on their core business," highlights Director of the TEW Frank Föhrigen. "On the basis of the production profiles of the businesses here, a supply structure has been created of which everyone can make use," explains Föhrigen, before mentioning services such as compressed air and refrigeration, as well as steam and water. With its 70 employees, TEW supports pharmaceutical companies with the planning, construction and operation of their operational facilities. "At this location, no company needs to worry about a security concept or their electricity supply; nor do they have to think about environmental protection, occupational health and safety or janitorial services," explains Frank Föhrigen, citing some examples of the services offered by TEW. Among others, the expert team includes engineers, electrical engineers, automation technicians and craftsmen who are familiar with the particular conditions in pharmaceutical companies. "We provide maintenance and repair services and are on site straight away in the event of emergencies," says the TEW manager. In addition: "Anyone who wants to set up their business here can rely on our expertise – starting with the application and approval process." All in all, the service network at the BioPharmaPark minimises the costs and business risks, and facilitates access to markets and customers. The company IDT Biologika can only confirm such comments. IDT Biologika develops and produces vaccines and pharmaceutical products on the basis of biotechnology, which have the objective of maintaining the health of humans and animals. While the company once focused on vaccines for tetanus, erysipelas and diphtheria, it now focuses on a wide range of problems worldwide, for which it finds the appropriate solutions. IDT Biologika is increasingly conquering world markets with the development of its own products, especially in the area of animal health, for example, a vaccine against oedema disease in piglets. "Writing our 'recipe book' is also one of our core areas of expertise," says the Chief Science Officer of IDT Biologika, Andreas Neubert. What this actually means is that on behalf of international companies, IDT Biologika develops the technology for the production of bacterial and viral vaccines, including new vaccines against serious diseases that are currently prevalent all over the world. "If the customer so requests, in addition to the development of the active agents, we are also able to produce them – and we are one of the few companies that is able to do so worldwide," says Neubert, referring to the entire value chain that the company covers; this includes its own high-speed bottling line and state-of-the-art infrastructure that allows for a production and transport chain at up to minus 80 degrees Celsius. In 2017, the turnover of IDT Biologika totalled approximately 241 million Euros. Since its privatisation in 1993, IDT has invested approximately 400 million Euros in its Dessau location. Regarding the location of the company in the BioPharmaPark, Andreas Neubert highlights the transfer and exchange of pharmaceutical expertise: "As businesses, this puts us in a position that allows us to do things that others can’t." "We use the synergies and co-operations at the location in the interests of adapting our production to the requirements of our customers on a rapid and flexible basis – and that includes the future,” confirms Christin Richter, Head of Business Development at ONCOTEC Pharma Produktion GmbH. The global company fabricates aseptically-produced liquid cytostatic drugs, i.e., sterile injection solutions in bottles or pre-filled syringes. It also has systems which freeze-dry the bottled liquid to make it suitable for long-term use. In this special area ONCOTEC offers the entire value added chain, from the development, to the market launch, all the way through to the production, including the inspection and analysis. Merz Pharma is also investing in newly built facilities. Here at the BioPharmaPark Dessau, the construction of its new production plant for the fabrication of dermal fillers is under way. The work is due to be completed in 2018. “We are going hire more natural scientists, engineers, pharmacists and chemists”, says location manager, Michael Pfeil. The pharmaceuticals company, which is based in Frankfurt am Main, set up a new location with its own research and development department here in 2002, partly due to its excellent collaboration with IDT Biologika. "We have found the appropriate know-how and the necessary infrastructure here," highlights Pfeil. Following the creation of a production facility for the production of the active agent botulinum neurotoxin, Merz invested another 18 million Euros in a state-of-the-art aseptic production facility for the production of the proprietary drug "Xeomin" at the Dessau location. It is used for the treatment of spasmodic illnesses. It has been approved for the American market since 2011, where it is sold as a proprietary medical product of Merz. "Another application of the toxin botulinum is as a skin smoothing product,” explains Michael Pfeil, who goes on to explain that his company also uses this ingredient in aesthetic products under the brand name "Bocouture". Merz is investing 15 million Euros in the new production facility for the production of dermal fillers. Like the other companies at the BioPharmaPark, the company appreciates the close proximity to the world of science as well as the universities of Halle, Leipzig and Berlin. For some months, Anke Sterzing and Tommy Hielscher have been revolutionizing the food industry with a sparkling business idea. Hailing from Magdeburg, they have invented "Beauty Secco", which not only contains a substance that helps to keep the skin looking younger and supports the muscles, but also comes with pleasure and a portion of wellness.